Small Batch Meyer Lemon Scones for two. I’ve created a little lemon monster in my house, and I’m here to warn you. She’s 2 years old, her name is Camille, and she’s got lemon seeds in her pockets to prove it. If you cross her, toss a lemon near her, and run the opposite direction. If you don’t get away fast, you’ll feel the full effect of the terrible twos! I’ve always been a lemon dessert lover (more than chocolate, thank you and please close the door on your way out). I’ll take a lemon bars over brownies, lemon pie before apple pie, and Meyer lemons over regular lemons. My daughter has always wanted to eat whatever I’m eating, and so she has become a lemon lover, too. When I spied a bag of this year’s Meyer lemon crop, I stocked up. I used to have a Meyer lemon tree in my front yard in California, and I miss it so much! Yes, I still think about that tree! Camille was asking for a lemon slice as I was making these small batch Meyer lemon scones, and I handed it to her. I didn’t expect her to eat the entire thing, skin and all. Yikes. Then, she ate a scone right when it came out of the oven, too. She’s hooked. 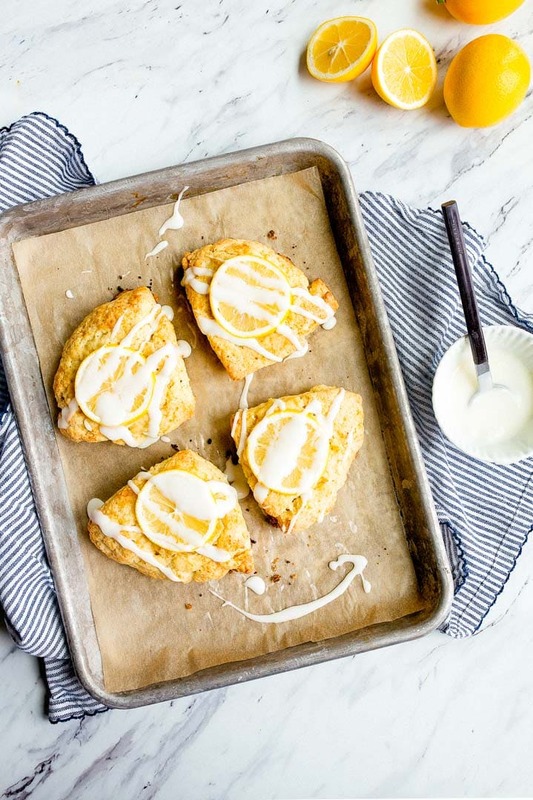 I haven’t made a scone recipe for you since 2013 (and it was these Black Pepper Scones with Maple Glaze), and really, that scone recipe is so solid, you hardly need another one. My scone recipes are made with heavy cream (as all scone recipes should be), has a very tender crumb, and is subtly sweet. One-quarter cup of sugar total for four scones is the perfect amount of sweetness. The lemon glaze on top is entirely optional; I admit I make these without the glaze most of the time. Since you only need the Meyer lemon zest, I squeeze the rest of juice into a container and make lemonade for Camille with it. Meyer lemons are sweeter than regular lemons (they’re a cross between a regular lemon and mandarin orange), I can use less sugar when making lemonade. And anything with less sugar for kids is GREAT in my book. 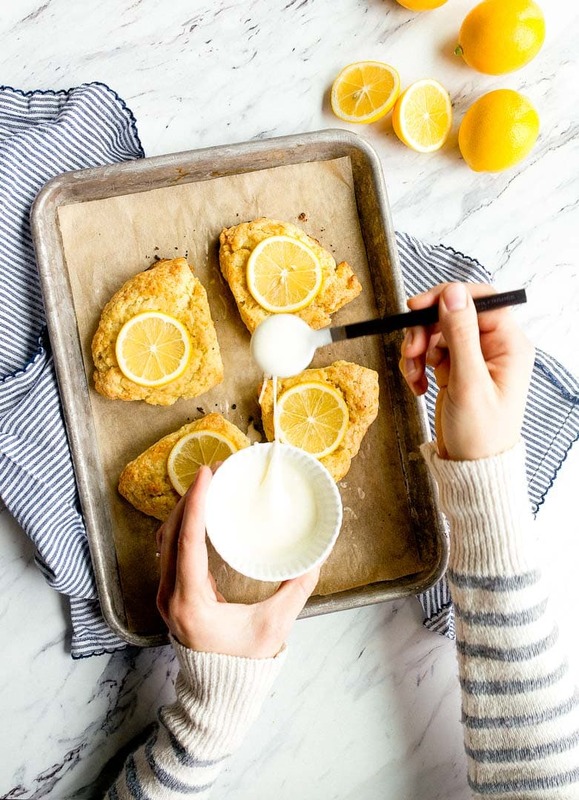 -These small batch Meyer lemon scones are made with all heavy cream, which is how scones should be made (in my humble opinion), and this makes the scone super flaky! -There is only 1/4 cup total of sugar in the recipe, which makes them slightly sweet. The glaze on top is optional, but delicious. -You can definitely use regular lemons, or any other kind of citrus. Check the comments for recipe variations made by fellow small-batch bakers. 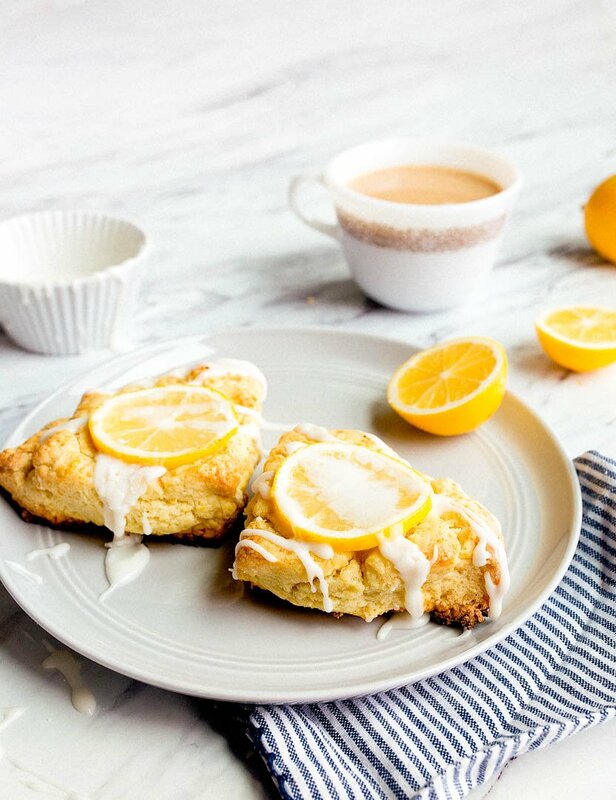 Ok, I’m sending you off into the weekend armed with a recipe for a small batch of Meyer lemon scones. Get to work, friends! If you’re looking for the mini quarter sheet pan I use when baking a small batch of scones, it’s here. 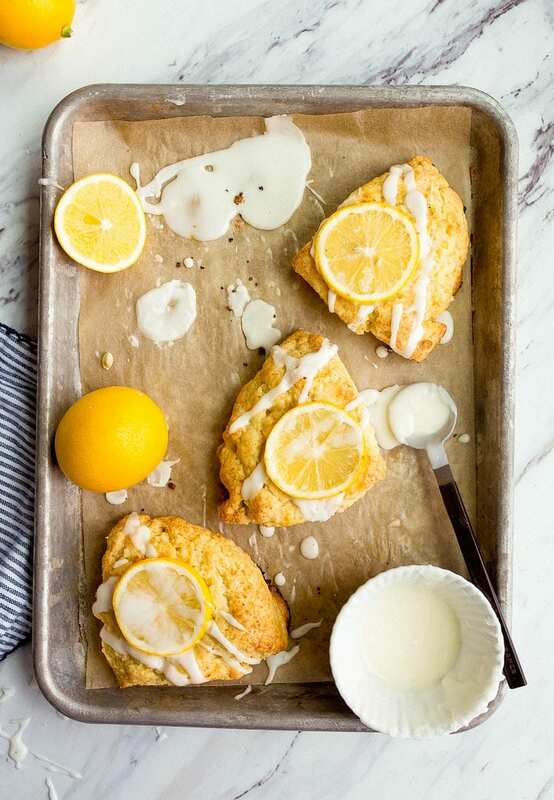 Small Batch Meyer Lemon Scones for Two. Makes 4 small scones! In a medium bowl, stir together the flour, sugar, salt, baking soda, and baking powder. Dice the butter and add it to the flour mixture. Work the butter into the flour mixture until it's evenly distributed and smaller than peas. Use two knives, a pastry cutter, or your hands. Next, add the heavy cream, egg yolk and lemon zest in a small bowl and whisk together. Pour this on the flour mixture and stir until a shaggy dough forms. Don't overmix, but incorporate things well. Scoop the dough out, place it on the baking sheet, and use the warmth of your hands to make it stick together into a circle. Bake for 13-15 minutes, until a toothpick inserted comes out clean and they lightly brown on the edges. While the scones bake, whisk together the glaze ingredients. Pour on the scones when they come out of the oven. Serve immediately. ***If you top the scones with extra lemon slices before baking, make sure you are eating the scones the same day. 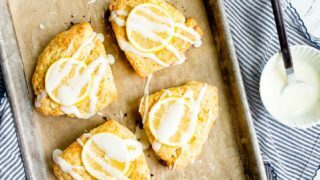 Leftover scones get soggy with a lemon slice on top. Enjoy! If I were to adapt the base scone to a cinnamon or non-citrus flavor do you reccomend adding water in place of the lemon juice for the best texture? I LOVE lemon (team lemon for life!) but my partner ADORES cinnamon scones and I refuse to make a giant batch so this recipe (specifically the downsizing!) is a GEM in my morning read. Thanks for writing in! Glad you like the recipe! My son is into lemons, as well!! Got a 1/4 sheet pan for Christmas and this looks like the perfect way to break it in!!! Happy 2018!!! If I only have regular lemons (not Meyer) – do any adjustments need to be made? Your post reminded me that I haven’t made them since the kids moved out several years ago. This looks like just the right amount for hubs and me. My daughter was/is a lemon monster, too. We had to cut her off because the acid is so hard on tooth enamel, but I suspect she still sneaks a fresh lemon slice now and then. Thanks so much for the recipe – I can’t wait to try it! I love, love, love lemon! But did I miss it: when do you add the zest? I swear I’ve read the recipe six times and don’t see that step. I’m guessing it gets added to the dry before you add the wet, but please advise! I have been dying to make these scones from the moment I saw the recipe, Christina! This morning, I could wait no longer… I didn’t have Meyer lemons, but regular lemons worked just fine! They were absolutely delicious! So soft and tender, and the glaze was the perfect topping. Of course, there is not a crumb left! Ha! So glad they only made four.. perfect! Another great recipe, thanks Christina! I love lemon!! Looking forward to making these! Made these today—total perfection! Clearly I’ve been living under a rock and have never heard of Meyer lemons until I saw this recipe, but will definitely be making these a staple at the house! Thank you! I just made the small batch scones,but using orange zest and drizzled homemade caramel. Quite delicious. The texture is excellent and my shaping was dubious. I just made these (no Meyers, but regular lemons worked just fine). I added 1/2 tsp. crushed lavender – so good! And the recipe is the perfect amount! i have been making scones from different recipes found on the internet and this is the best. The only variation was i used regular lemons and added some walnuts. Now, i am going to try the black pepper recipe. Thanks for your help! I am about to go and try this out with my fingers crossed. I’ll be back to share my first scone making experience! No lemon juice in the actual scone (only lemon zest)? Yes, Angela. I save it for the glaze :) Enjoy! Thanks Christina. This is a terrific recipe. I’ve tried it with Meyer lemons & regular lemons and both turn out great. I’m not big on glaze so I add 1 tbsp of the lemon juice to the scone for added flavor. Amazing!! Love all your small batch recipes. Now that I’m team Keto, do you think I can replace the flour with coconut/almond flour and have it still turn out ok? One day I’ll eat these with flour, but until then I have 30 more pounds to go. hmmm…I haven’t tried that yet. Is the flour blend you’re using say it’s a 1:1 direct substitute for regular flour? Coconut flour is so weird…it absorbs SO MUCH liquid. Do you ever bake these (or any of your other recipes) in a toaster oven? I’d love to use mine in the hot summer months. Do you think I can sub 1/2 and 1/2 for the heavy cream? I always have that in the house! If not will def buy the heavy cream…they look so yummy! I am pretty much the only lemon junky in in the family, so a small batch is invaluable! Thanks a lot! I am thinking of adding tiny lemon pieces (no skin) inside. Do you think it’ll make them soggy? I love your recipes and will make these scones right now (can’t wait!) but usually have a problem converting the measurements as I live in Europe and we use a scale for weighing ingredients in (kilo)grams or measure volume in milliliters (which roughly translates to grams, how awesome is that?!). I find using a scale to be easier, more accurate and less messy because it dirties fewer dishes/cups. I know it is a lot to ask, but have you considered adding weight information to your recipes? I have made these twice now, to great success. The first time I made with regular lemons (really good!). The second time I used the base recipe but made them vanilla scones instead using the scrapings from a vanilla bean instead of lemon zest, and then did a light drizzle of glaze made with confectioners sugar, vanilla extract, and a little milk. I cut them into 8 wedges, and they were amazing! They put Starbucks mini vanilla scones to shame. Thanks for the recipe -I’m so glad I stumbled upon you on Instagram. This recipe has set my bar for scones and I can no longer buy them from anywhere! These are unctuous & moist, while most bought ones are hard and not nearly as tasty. Thanks for all the hard work you pour into providing all of us with amazing recipes! I have made these before and they are fabulous! Can the dough be made ahead of time and placed in freezer in individual triangle shapes to bake the next morning? I want to make these for my folks but would rather bake them at their house so they will be fresh out of the oven. Thank you. another great thing to do with lemon scones is to add a little candied ginger, chopped on top or mixed in. That sounds amazing! I love ginger! Hmmm…Hayley. I’m sorry you’re having trouble. Are you double sure that you measured everything correctly? Did you add extra cream? I got a bumper crop of Meyer Lemons off the tree I planted last year. I love your blog and was happy to find this recipe to use up some of my lemons. I made these for breakfast today and they were amazing. I added the glaze right out of the oven. These scones were light in both texture and taste. Just a hint of lemon and sweet. I will be making these again and again with the Meyer Lemons off my tree. The nutrition information says one scone has 1772 calories. Is that correct??? No, the nutrition calculator is being wonky. Divide that number by 4 for accurate nutrition.